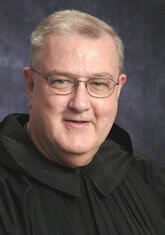 Brother Richard Oliver OSB, Monk of Collegeville, Minn. Webweaver. "The Scumblers" - a group of early 20th century artists in Pennsylvania. "Bro. Richard’s Favorite URLs" is an early collection of classified links assembled before there was Google. I returned to the abbey, mid-August 2016, to cordinate group tours of the abbey church, work part-time at the Abbey Guesthouse, and manage the website for Bridgefolk: Mennonite-Catholic dialogue. I represent Abbot John on the board of the Hill Museum and Manuscript Library. I also served on a commission established by the Abbot Primate to plan the renovation of the Order of Saint Benedict website that went live Tuesday, 4 September 2018. Google stores online photos I take with my Samsung Galaxy 6 Android phone. 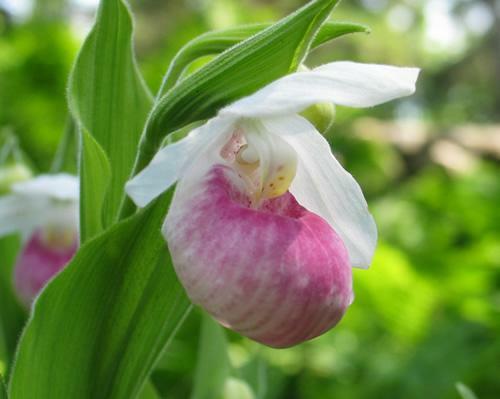 The photo at left shows Cypripedium reginae, also know as the pink and white moccasin flower, or "Showy Lady Slipper." It was adopted as the official state flower of Minnesota on 19 February 1902 and appears in the "Arms of the State of Minnesota." At a certain stage of life I was very much interested in heraldry, including ecclesiastical heraldry, and read much about it. The American Benedictine Academy: President Emeritus. "Ellis A. Oliver (1872-1937)," my grandfather, was a member of The Scumblers, Pennsylvania plein air artists who gathered in Edison, PA, in the first decades of the 20th century. 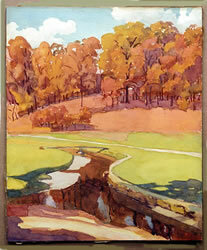 The watercolor above, "Autumn Reflections," was probably painted near Neshaminy Creek. To learn more about where the Scumblers spent their summers visit the Edison Gallery: Then and Now. "St. Richard of Chichester (1197-1253)," is my amiable baptismal patron.